The European Commission says it has started to implement its preparations for a no-deal Brexit - in case the UK leaves the EU without a plan. As PM Theresa May's proposed exit plan flounders in Parliament, both sides are preparing for what they see as the worst-case situation. The UK has allocated £2bn ($2.5bn) in funding to government departments. The European Commission's measures are designed to limit disruption in certain key areas, such as finance and transport, if Brexit goes ahead in March without a deal. "These measures will not - and cannot - mitigate the overall impact of a 'no-deal' scenario," it said in a statement. "This is an exercise in damage limitation," added commissioner Valdis Dombrovskis in a news conference, saying a contingency plan was necessary "given the continued uncertainty in the UK". The commission's 14 measures cover legislation that will aim to ensure some continuity. 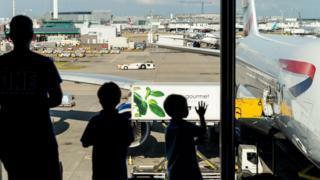 Flights from the UK into and overflying the EU to be allowed for 12 months to ensure "basic connectivity"
The commission has also urged its 27 remaining member states to take a "generous" approach to the residency rights of UK citizens in the EU following a no-deal Brexit, "provided that this approach is reciprocated by the UK". The Commission says these measures should not compare with EU membership, or the transition period on offer in the Withdrawal Agreement - which the UK Parliament has yet to vote on. BBC Europe editor Katya Adler says Brussels will be keen to point out that these proposals are not in the UK's favour. What does this mean for UK citizens? This demonstrates where the EU has a limited remit. The proposals on UK citizens living in EU countries rely on the governments concerned because it involves areas of national - not European - power. A senior EU official said the only way of properly looking after citizens was via the withdrawal agreement agreed between the UK government and the EU. The EU has been slightly more generous than expected in its planning for a no-deal Brexit. Its proposal that British truckers can carry on trucking in the EU for nine months before they have to apply for scarce international permits will be welcomed by the industry. Some of the measures will also be in place for longer than previously suggested. For example, the bare-bones aviation legislation will last until March 2020, not December 2019. Some of the measures recognising the UK's financial regulations as equivalent to the EU's will continue for up to two years. Brussels isn't doing this out of the goodness of its heart. This is the product of calculation of what is in its interests and which vulnerabilities need to be protected. And the European Commission is clearly concerned about countries doing their own deals with the UK, hence a plea not to. But the message from Brussels is clear: the deal that's on offer is way, way, way better than no deal at all. Why are the plans being released now? The European Commission's initial guidance on the issue was published in November. The issue is heating up because Mrs May's proposed deal, which was agreed with the EU, has so far failed to gain enough support in the UK Parliament, which will vote on it next month. 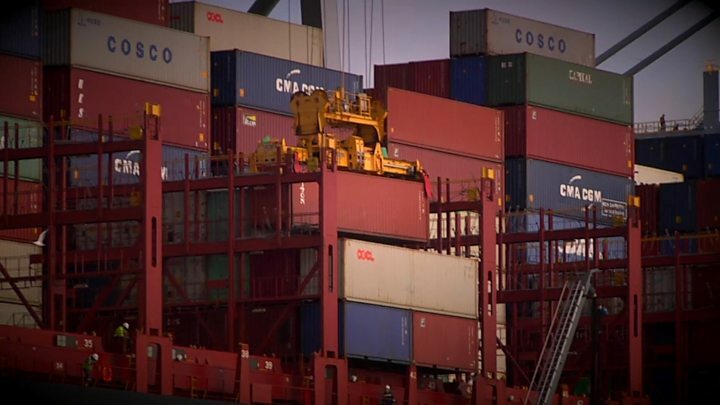 On Tuesday, the cabinet said it had decided to "ramp up" preparations for a no-deal Brexit.